The ideals of Greek art are considered by historians to be the foundation of Western civilization and to have touched literally all aspects of modern western culture. The history of ancient Greek art mainly in the form of sculpture is composed of roughly three periods: the Archaic, the Classical, and the Hellenistic. The Archaic is rather stiff and primitive; the Classical becomes more sophisticated and realistic; and the Hellenistic becomes flowery and highly decorative. These three periods can be thought of in the same way as the three periods of Greek architecture – the Doric, the Ionic, and the Corinthian. Doric columns are the most simple, Ionic are more highly decorative, and the Corinthian are downright over the top and lavish. This simple connection can help art lovers remember the differences. In the Archaic period of Greek art [800-500 BC], sculptures were placed on pedestals lining the way to the entrance to a main temple or for marking graves. The typical statue is of either a male or female figure assuming a rather stiff pose. Male statues are called kouroi (simply meaning “young men”) and represent gods, warriors, and athletes. The female statues are called korai and depict clothed priestesses, goddesses, and nymphs. Always each has the thin-lipped Archaic smile, perhaps echoing the prosperity and relative peace of the time. During the Archaic period, Greek artists try to achieve realistic likeness in picturing the human figure, and the statues are a far cry from the extremely abstract figures of the geometric style which preceded. In fact, the statues show the influence of Egyptian art in its stiffness, gracefulness, and idealization. But the artists weren’t quite comfortable with achieving naturalism yet. The archaic smile, outstretched palm, clenched fist, and wooden posture of a striding figure are all stylistic devices that compensate for an inability to portray a figure in realistic full action during this emerging stage of naturalism. During this period [500-323 BC], Greece reaches the height of economic success and cultural and artistic splendor. 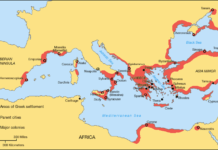 Its expansionist foreign policy triggers revolts throughout the Hellenic world and rivalry with Sparta, Corinth, Thebes, and Syracuse leads to much fighting and bloodshed. Gone is the dreamy Archaic smile from the sculptures. 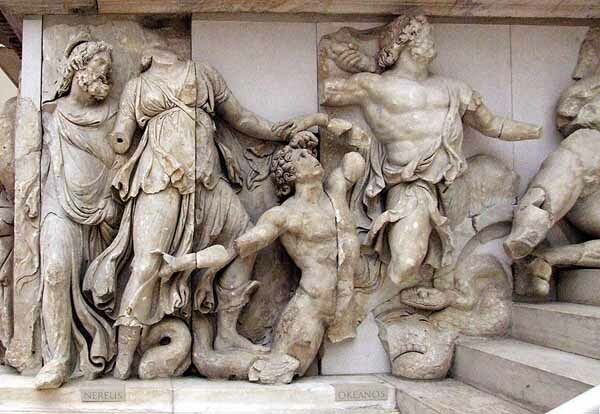 The Classical period of Ancient Greece produced some of the most exquisite sculptures the world has ever seen. The art of the Classical Greek style is characterized by a joyous freedom of movement and freedom of expression. It celebrates mankind as an independent entity. Artists hold their aesthetic standards to a quest for ideal beauty; this leads to their depicting the human figure in a naturalistic manner because it is the first time in human history that the human body is studied for its aesthetic values. They replace the stiffness of the human figure from the Archaic period with a free-flowing form more true to life. The most significant change is the counterbalance, or s-curve, of the body, known as controposto. One foot comes forward so that one leg is relaxed and the other bears the weight of the body; the pose is much more naturalistic. In the art of Greece during the Classical period the characteristic smile of the Archaic sculpture is replaced by a solemn facial expression. Even in sculptures which depict violent and passionate scenes the faces betray no expression; however, their enemies have dramatic facial expressions. Ancient Greeks believed that suppression of the emotions is a noble characteristic of all civilized men, while the public display of human emotion is a sign of barbarism. Logic and reason are the dominant human qualities even during the most dramatic situations. This is the period that of course so greatly influenced the ascendance of the Renaissance when Italian scholars, writers, and artists experienced a rebirth (“renaissance”) of classical values after the Middle Ages. 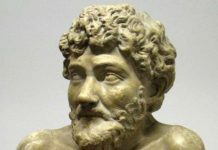 The Classical period is considered the golden age for the arts, literature, philosophy, and politics and its principles continue to influence western civilization today. The Hellenistic period occurred from the third to the first centuries B.C. in the times that spring up after Alexander the Great’s conquests. This is a great time of prosperity that encourages the production of art of a more secular nature. A new reality emerges in Greek sculpture. Instead of depicting ideals such as logic and suppressed emotion or perfect beauty, the artists explore reality. For instance, “the Boxer” shows the boxer’s bleeding knuckles after the fight. Humane themes such as childhood, old age, ugliness, and suffering are now of interest and are treated with great exuberance and pathos. The Laocoon is the epitome of this style. The Hellenistic period is above all a period of eclecticism. Artists expand their work with dramatic poses and emotions, sweeping lines, and high contrasts of light and shadow. 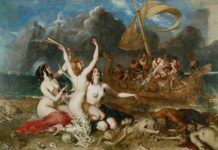 The conventions of the Classical period give way to this new experimentation and freedom that let artists explore subjects from different points of view.